With the holidays around the corner and Batman still on the lips of countless consumers, Warner Home Video is jumping on the bandwagon and releasing an elaborate collection of the entire Batman: The Animated Series run, from the very first episode to the very last. It’s a smart idea and, for those fans who may have passed up the original volume releases of Batman: The Animated Series, they now have a great looking box set to put on their shelves. But, is it a good deal? Well, we’ll look into that once we get the standard synopsis out of the way. When two shots rang out, Bruce Wayne’s life changed forever. He pledged himself to justice, and he held that oath for years. Wearing many names – the Dark Knight, the World’s Greatest Detectives, the Caped Crusader and Gotham’s Greatest Hero – he battled tragic foes like The Joker, Penguin, Mr. Freeze and so many more. But deep inside, he knew that he shared something with them that most of humanity wouldn’t understand – a commitment to the fight. 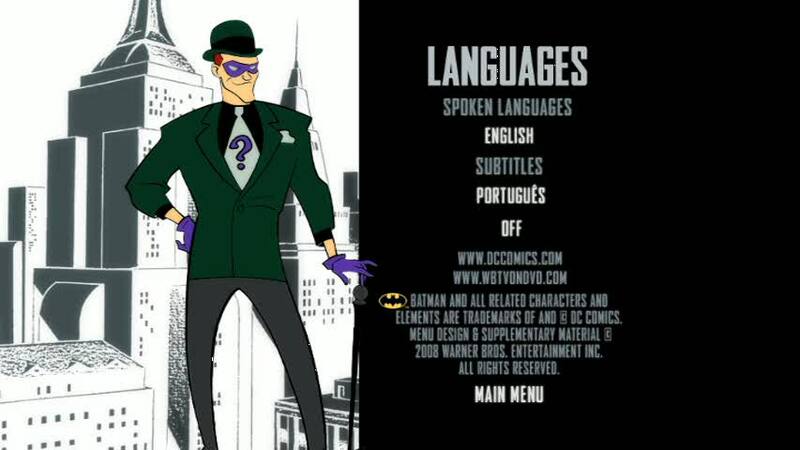 The acclaimed, Emmy-winning TV series redefined this complex man as an edgy hero struggling for revenge and redemption each time he donned the cape and cowl, and this Comprehensive 17-Disc DVD Batman: The Complete Animated Series collection contains every episode, with all the allies, criminals and showdowns in Batman’s history. Since this review is primarily on the DVD release itself, and the new content it contains, this part of the review will be brief. What else is there to say about Batman: The Animated Series? Whether you’re a comic fan or not, an animation fan or not, it’s hard to ignore how revolutionary this series was. It completely changed the face of animation as we know it. It was a series that not only refused to speak down to younger viewers, it also kick-started a multi-series continuity that fans still rabidly follow to this day. It was a monumental series, one that is still acknowledged as one of the best cartoons ever created to this day. And it should be, too. The series is just that good. And, to be honest, I could go on and on about how great this series is. I truly could! But, I’ll spare you all that. I mean if you look at my other work, such as the The World’s Finest website for example, that should tell you what my thoughts are on this series. But, still, I’ll say a few more words before moving onto the reason why everyone is reading this review – the actual DVD release. Batman: The Animated Series was one of those rare occurrences where everything just went right. Sure, some of the early episodes are uneven, and there is the occasional bad episode, but, for the most part, everything went right here. The writing, the directing, the acting, the designs, all of it. It all came together like no other animated series before it, and is still inspiring other cartoons to this day. This show effectively nailed why Batman…was Batman. Like nothing else before it, even the comics, this stripped away all the garbage from the character and just left the gold. And we got gold. The fans knew it and the critics knew it. The best way to describe this series, I suppose, is that it…well…it was Batman. And this collection celebrates that. The complete Batman: The Animated Series is truly something that everyone, and I mean everyone, should check out. I’m sure they’ll be pleasantly surprised by what they see. It has writing that equals, and usually surpasses, anything found in prime-time, or even on the big screen. Episodes like “Heart Of Ice,” “Two-Face,” “Mad Love,” “Over The Edge,” and “The Demon’s Quest,” among many, many others, are testaments to how brilliantly the creative team handled this series. Nearly every episode has something positive to offer the viewer. Yes, there’s some weak episodes, such as “Cat Scratch Fever” and “Moon of the Wolf,” but those can be easily forgiven when you stumble across an episode such as “Dreams In Darkness” or “Robin’s Reckoning.” I think it goes without saying that Batman: The Animated Series is a definite Must Own and is something that everyone, absolutely everyone, should see. Now, this is the part of the review that everyone, well the majority of readers here, are concerned about. Warner Home Video has released Batman: The Complete Animated Series in an elaborate collectible box set, and, well, fans will be very proud to have something like this on their shelves. So, let’s start on the outside and work our way in. Batman: The Complete Animated Series comes in a rather sturdy black cardboard case, which itself is covered with a transparent plastic sleeve. The plastic sleeve features a couple images of Batman, plus the name of the collection, with a rundown of the contents on a piece of paper soft-glued to the back. Once you remove the plastic sleeve and open the black casing, the contents are housed safely inside. First up is the 40-page booklet, featuring a written introduction by Alan Burnett and a massive amount of production artwork. Now, some of the artwork in here was previously featured in the acclaimed Batman: Animated coffee-table book, but there’s also a lot of new artwork to be found, including model sheets, character expressions, and beautiful background paintings. The booklet also contains information on each disc included in the set. And the discs? The disc count is 17, which amounts to one new disc and 16 discs already available in the individual Batman: The Animated Series multi-disc volume releases. These discs are exactly identical to the previous Batman: The Animated Series multi-disc volume releases. Every single thing. Menus, extras, disc art, the date stamp, the transfers, all of it, so there’s no need to revisit those. In fact, these are the discs from the previous multi-disc volume releases, since some of them still have the old classic “DC Bullet” from their original releases on both the disc art and menu systems. These are the exact same discs, so for those who bought the previous multi-disc sets, you won’t get anything new here. These discs are housed in two transparent double-sized Amaray cases, each with extra-hinge flaps to hold the 17 total discs. The only real new content is the exclusive bonus disc included here and the 40-page booklet. And, well, for those buying Batman: The Complete Animated Series for this new exclusive disc, you may want to think twice. 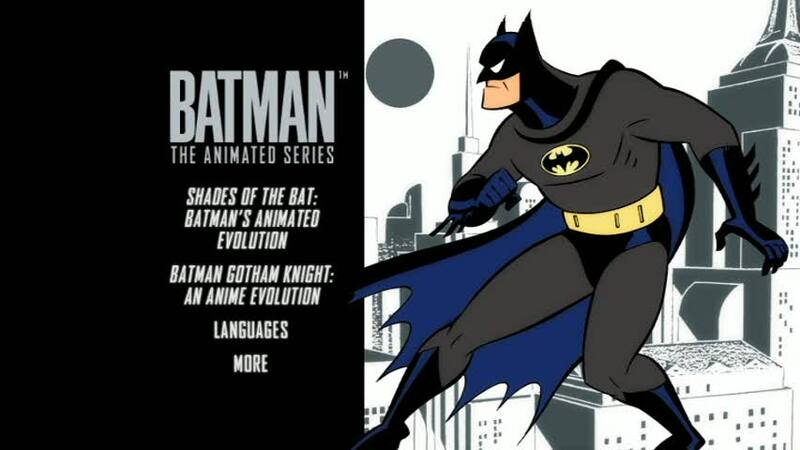 The new Shades of the Bat: Batman’s Animated Evolution documentary included on the disc is a roughly 23 minute look at Batman in animation, from past to present day. The documentary covers everything, from the character’s early days in Superfriends up to The Batman. As you can imagine, the majority of the documentary is spent on Batman: The Animated Series, though it does mention some notable animated appearances through the character’s animated history. And that is the main extra on the exclusive bonus disc, one which doesn’t cover any real new ground. Sure, it’s nice to see animation historians and talent discussing how important Batman: The Animated Series was, but there’s no new ground really covered here. The rest of the extras are essentially trailers. Batman: Gotham Knight – An Anime Evolution is the extended trailer from the Justice League: The New Frontier DVD release. After that, we get the same A First Look At Justice League: The New Frontier featurette from the Superman Doomsday DVD release, followed up by the Wonder Woman Sneak Peek featurette from the recent Batman: Gotham Knight release. After all of that, we get more trailers, including one for Superman Doomsday and another for the The Dark Knight DVD release. Essentially, the only new extra is the Shades of the Bat: Batman’s Animated Evolution documentary and the 40 page booklet. That’s not a lot of new material to entice those who’ve already purchased the previous Batman: The Animated Series multi-disc releases. So, when you head out to vote on Tuesday, November 4th, 2008 (Please vote! 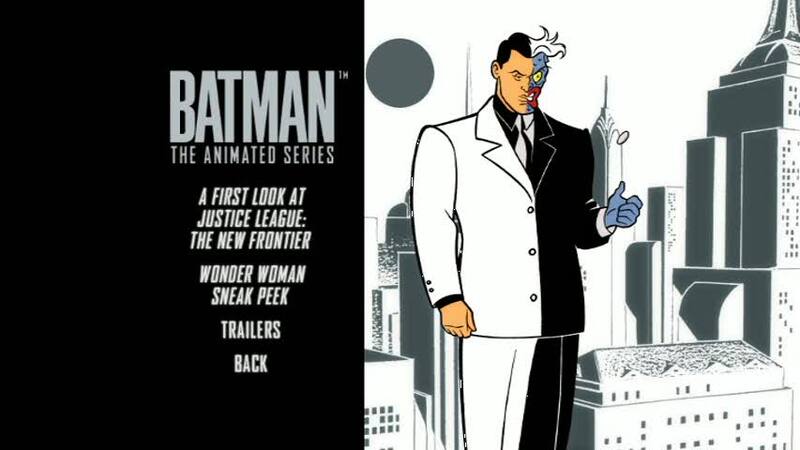 ), is Batman: The Complete Animated Series worth picking up on the way home? Now, this is where I’m torn. I personally believe this is a show that belongs an everyones collection, Batman-fan or not. The storytelling and artistry is something that is unrivaled even today. However, the new content exclusive to this release may not be worth the double-dip for those who already own the multi-disc DVD Volumes #1 – 4 of Batman: The Animated Series. With less than an hour of new DVD footage and a forty-page booklet, it’s hard to justify the over $100 price tag. It’s a really great collection, but it’s hard to blindly recommend it with that high price-point. However, the price of this collection is less expensive than buying all four volume multi-disc releases of Batman: The Animated Series, so, to those who haven’t bought any of the Batman: The Animated Series DVD releases, or just one of them, this release is worth it. So, is this a product worth recommending? Yes and no. For those who already own the four volume multi-disc releases of Batman: The Animated Series, this is something you can either skip, or wait to purchase at a low price point. 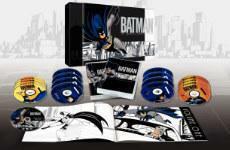 For those who have yet to buy any Batman: The Animated Series DVD releases, this is a Must Own. With the collection selling for upwards of $30 less than the SRP, this is quite a steal. Plus, you get every single episode of Batman: The Animated Series, a nice helping of commentaries and featurettes, and some material exclusive to the Batman: The Complete Animated Series release. So, just to repeat, to those dollar-conscious fans who already own Batman: The Animated Series on DVD, it’s safe to skip this release. But, to those who haven’t added Batman: The Animated Series to your collection, now is the perfect chance. Batman: The Complete Animated Series is a comprehensive collection of famed animated series, a collection worth adding to your collection. Batman: The Complete Animated Series arrives on DVD on November 4th, 2008.